Ceramics have been around for quite a bit. Depending on what timeframe you're working on, you might harken back to Roy Lichtenstein's ceramic teacup sculptures made in the 1960s—or, if you really wanted to be thorough, you'd have to look back a little further to the Czech Republic's Venus of Dolní Věstonice (29,000 – 25,000 BCE), the oldest man-made ceramic object ever found. 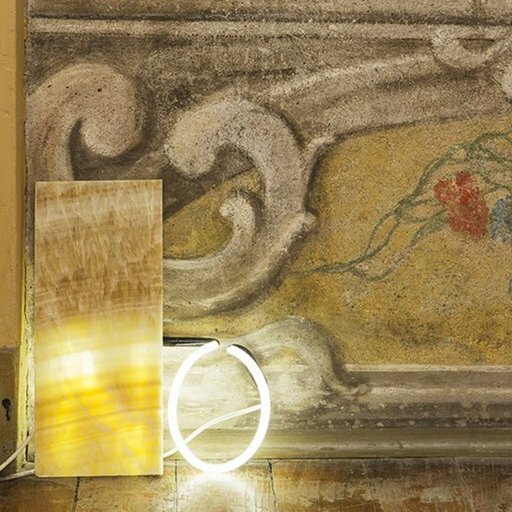 Suddenly, however, this ancient medium has started to look surprisingly contemporary: everywhere you look these days, from the Whitney Biennial to the recent Armory Show art fair to cutting-edge galleries around the world, ceramics are popping up in all their versatile, handmade physicality. So, why the vogue for fired clay now? Certainly Ken Price's retrospective of his vividly colored, biomorphic, and defiantly non-utilitarian ceramic vessels at the Metropolitan Museum of Art last year (and previously at LACMA) sparked renewed interest on the part of curators and artists alike. 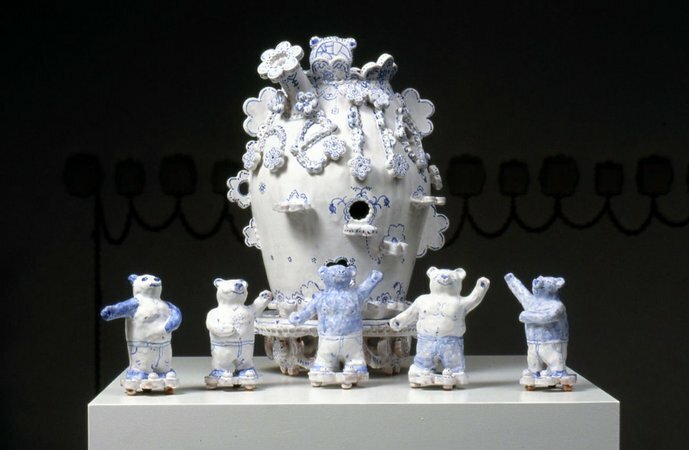 But artists like Jessica Jackson Hutchins, Shio Kusaka, and many others have been finding critical success in the medium for years now—in part precisely because ceramics' commonly categorization as belonging to the decorative arts makes them an outlier in the increasingly heterogeneous world of contemporary art, and appealing as a result. Made of the earth and imprinted with the artist's hand, ceramics have the ability to counter the conceptual dematerialization and fetish for sleek, commercialist aesthetics present in so much contemporary art. 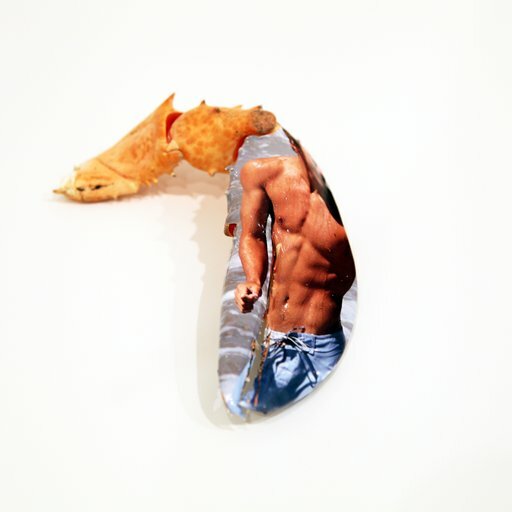 The medium has an innate authenticity, equally in touch with modern design and prehistoric fetish-objects. 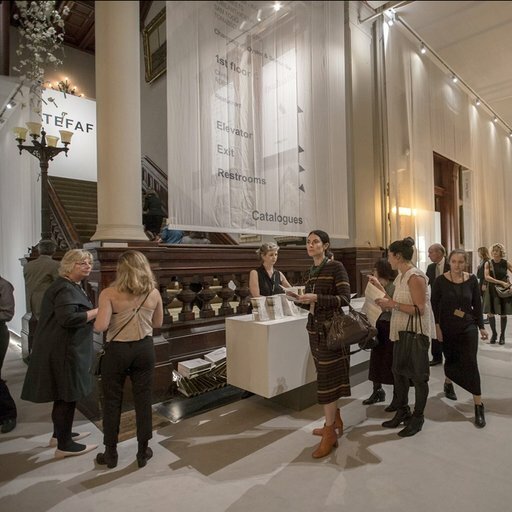 And artists who work with ceramics are disproportionately female, often older than their counterparts in other mediums, and are often portrayed as part of an 'outsider' or folk tradition and separate from the current cutting edge—all artistic demographics currently being recuperated into the mainstream art world to adjust for historical biases and oversights. That said, the rest of the art world is just beginning to catch on to the benefits and possibilities that contemporary ceramicists have long known. Below are a few examples of such intriguing, proficient, and entirely of-the-moment ceramic works that have stood out from fairs, biennials, and gallery shows in recent months. 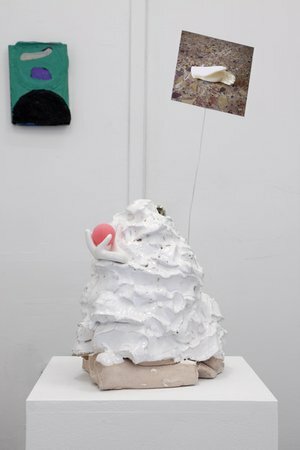 In a current split-bill show with Sadie Laska at Greenpoint gallery Cleopatra's, Magenheimer's ceramic-assemblage hybrids act as conduits between two-dimensional and three-dimensional media, like a transformer in an electrical circuit. Magenheimer exploits ceramic's plasticity by embedding found objects in mounds of clay, treating the material simultaneously as a support, a pedestal, and a sculptural medium. Interestingly, Magenheimer's other work is in video and media installations, lending her ceramic work a contextual iconoclasm that only heightens the role they play in her installations. Shinichi Sawada, from Japan's Shiga prefecture, is an extremely autistic man who began making his bizarre, pointillistic ceramic figures in a pottery workshop in 2001. 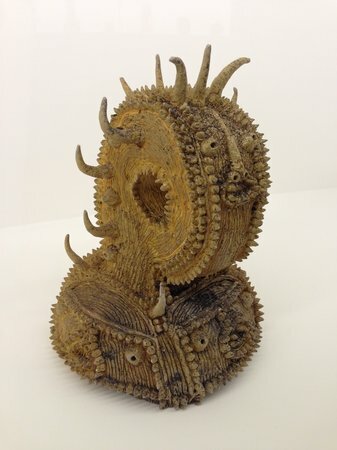 Sawada's ceramics were included in the central pavilion of the 2013 Venice Biennale, curated by Massimiliano Gioni; and while in that context they were exemplary of the increased interest in outsider art, in the tradition of "the art of the insane" they also have an undeniable and unique aesthetic peculiarity. The octogenarian Venice Beach-based artist, who is currently the subject of a solo exhibition at alternative New York gallery White Columns, often works in collaboration with her husband, Michael Frimkess. 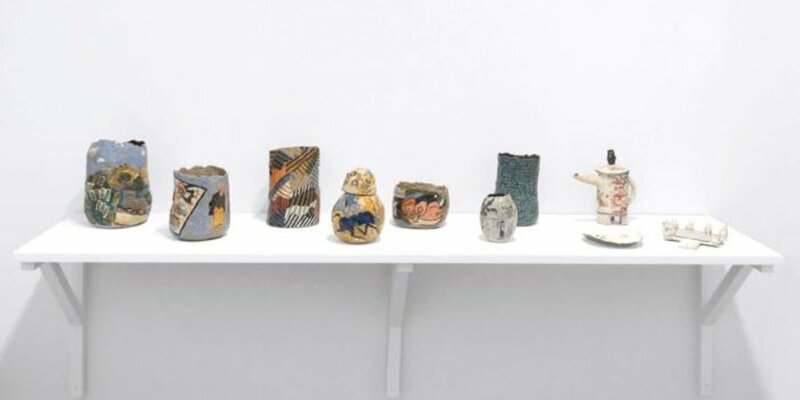 Suarez-Frimkess's ceramics hopscotch between visual references: some of them look like ancient Mayan votive objects, others like Mickey Mouse souvenirs. Sometimes, such disparate references are combined in a single piece. 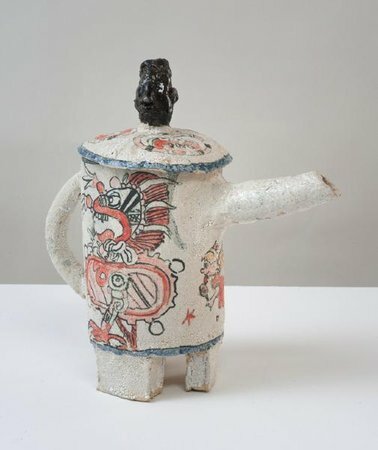 Suarez-Frimkess's works perfectly realize ceramic's history-spanning associations, and the cerebral leapfrogging we go through when faced with these objects. Of course, there's plenty to do with ceramics other than make pots or figurines. Jennie Jieun Lee takes a counterintuitive approach, creating big, bulky, oddly shaped masks made from glazed stoneware. (Technically, all stoneware is ceramic, but not all ceramics are stoneware.) The marbled effect Lee creates demonstrates the medium's remarkable versatility as a vehicle for color, and leads to some remarkably complex compositions. 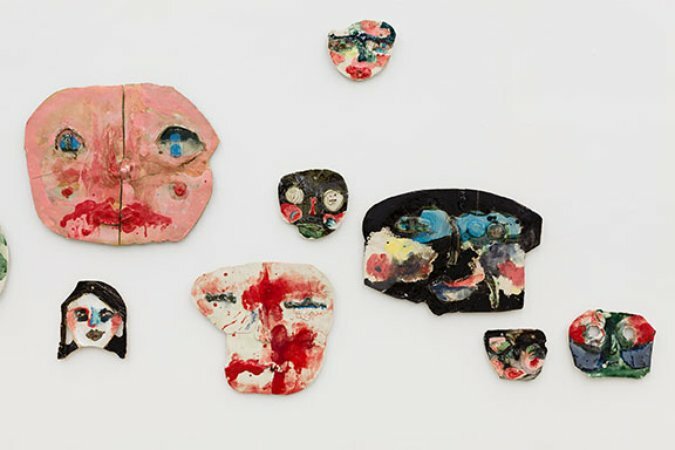 Los-Angeles based Sterling Ruby works in a variety of mediums, including painting, installation, sculpture, collage, and video. He's well known for his ceramic vessels—the one above is also on view at the Whitney Biennial—which are influenced, aesthetically, by the California craft movement as well as the anarchic aesthetics of graffiti and street art. 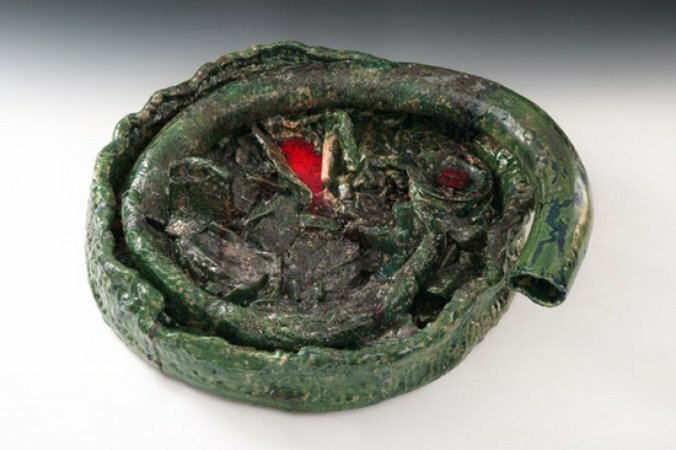 The ceramic works in Ruby's "Basin Theology" series (which evoke baptimsal fonts) incorporate the remains of the artist's old, destroyed works of art, which makes the new ceramics function like the sedimentary layers of an ancient archeological site. Jeffry Mitchell directly cites the tradition of cutesy decorative porcelain in his earthenware sculptures. Some of his work depicts cheerful bears that recall those garish figurines you might find in a Salvation Army thrift store; other pieces resemble more ancient forms, like Roman portrait busts. Mitchell, who is based in Seattle, also makes drawings, prints, and architectural sculptures enlivened with the same slightly off-kilter cutesiness. 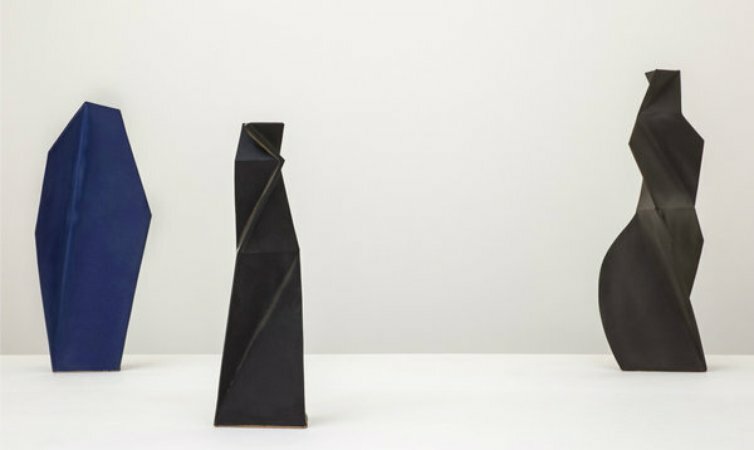 Beside their oddity and pathos, Mitchell's sculptures are also technically complex and impressively crafted—particularly his most recent work, which departs from the china look in favor of dark, earthy complexity. 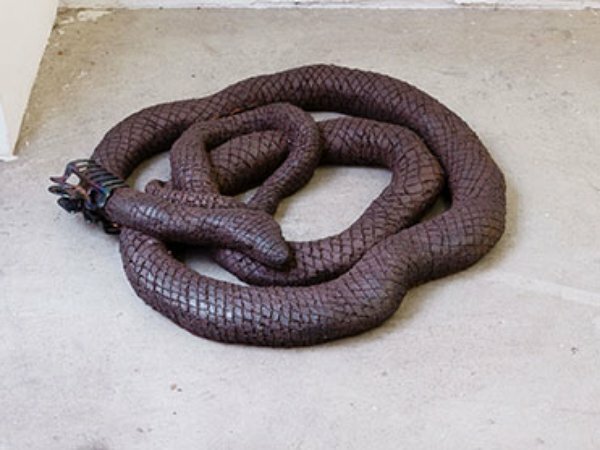 Two of Liz Craft's creepily lifelike ceramic snakes were recently shown in a group exhibition at Martos Gallery in Chelsea. 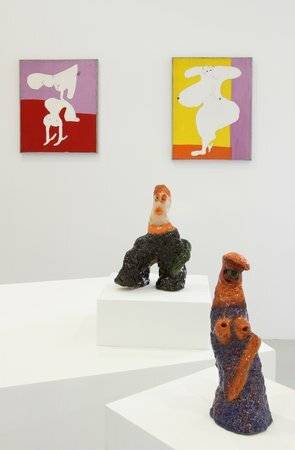 Craft's snakes display ceramics' aptitude for uncanny realism; the Los Angeles-based artist's 2010 solo exhibition "Death of a Clown" at Patrick Painter Inc. included a ceramic clown leaned up against the gallery wall. For Craft, ceramic is a medium that sutures the real to the fantastic: her works are the products of dream-states that inhabit gallery spaces as if they've escaped directly from the artist's brain. 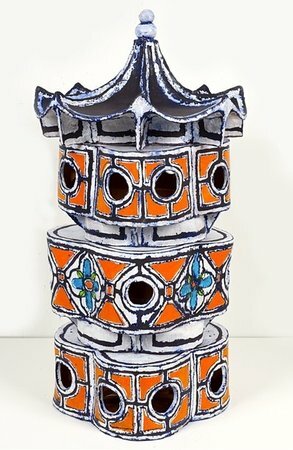 Elisabeth Kley's work will be featured at the upcoming NADA Art Fair in SEASON's booth. The artist puts ceramics to use in crafting small architectural structures—birdhouses, pavilions, pagodas, and so on—which she occasionally turns into fountains by inserting water hoses. They're a little bit like the adobe abodes that Charles Simmonds built for his imaginary "little people" in the 1970s, if the little people had a flair for Mexican architecture via Japanese wabi sabi.